With neither business owners nor workers’ unions satisfied with the latest settlement of the legal minimum wage for next year, South Korean President Moon Jae-in struggled to appease both sides, while admitting his election pledge to raise it to 10,000 won by 2020 was nigh impossible. His comments followed a string of oppositions lodeged by both the business and labor sides, while his chief financial policymaker criticized the double-digit growth as hurting the economy. “There are signals that the minimum wage (increase) is exerting visible impact upon the employment of specific age groups and job clusters,” Finance Minister Kim Dong-yeon said in a press briefing held at the Bank of Korea, after a one-on-one meeting with the central bank’s Gov. Lee Ju-yeol. The top fiscal official’s remarks came in the wake of the latest decision by the Minimum Wage Council on Saturday to set next year’s legal minimum wage hike rate at 10.9 percent, raising the hourly amount to 8,350 won from the current 7,530 won. “The government will draw up follow-up measures to prevent small merchants and self-employed people from being impacted, not only through employment subsidies but also through commercial property lease protection, reasonable (credit) card fees and protecting franchises,” Moon said. 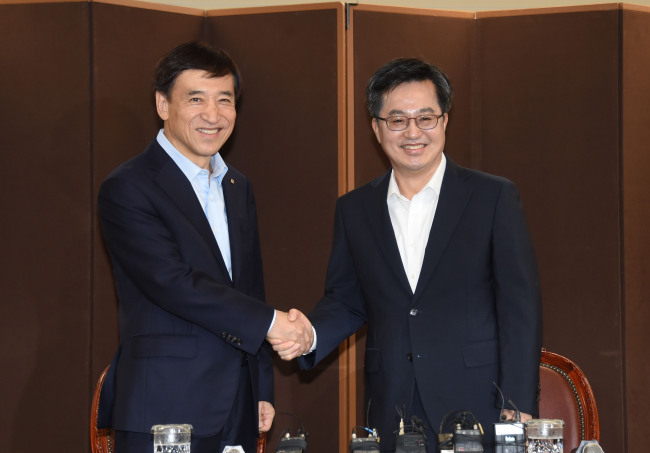 “Macroeconomic indexes are in line with the potential growth trend and market prices are relatively stable,” said Lee before his meeting with the minister. The monetary chief policymaker said that, despite volatility in some emerging economies, South Korea’s financial market has shown itself to be relatively stable, backed by its ample foreign currency reserves and strong fundamentals. Meanwhile, speculations mounted that the Ministry of Strategy and Finance may also inch down its economic forecast for this year. The ministry is set to confirm the economic policy direction for the second half of the year and announce the revised forecast figures by the end of this month, according to officials. The BOK, upon freezing the nation’s policy rate at 1.5 percent for an eighth consecutive month last week, lowered its previous 3 percent forecast to 2.9 percent. The Korea Development Institute, a think tank affiliated with the Finance Ministry, earlier said that this year’s growth would stand at 2.8 percent.